New Rules Go Into Effect At Busy U.S.-Mexico Border Crossing : The Two-Way At the San Ysidro crossing between San Diego and Tijuana, Mexico is requiring foreign pedestrians to show a passport and fill out entry paperwork. Pedestrians going to Tijuana from San Diego must now choose between a line for Mexicans, who get waved through the border crossing, and a line for foreigners, who must first show a passport. Fleeing to Tijuana? Not from the San Ysidro crossing, you aren't. While Mexican airports already follow similar regulations, the new process marks a shift toward a more structured approach for registering foreigners entering Mexico on the ground. Previously, foreigners were allowed to cross the 1,954-mile Mexico-U.S. border essentially without restriction. 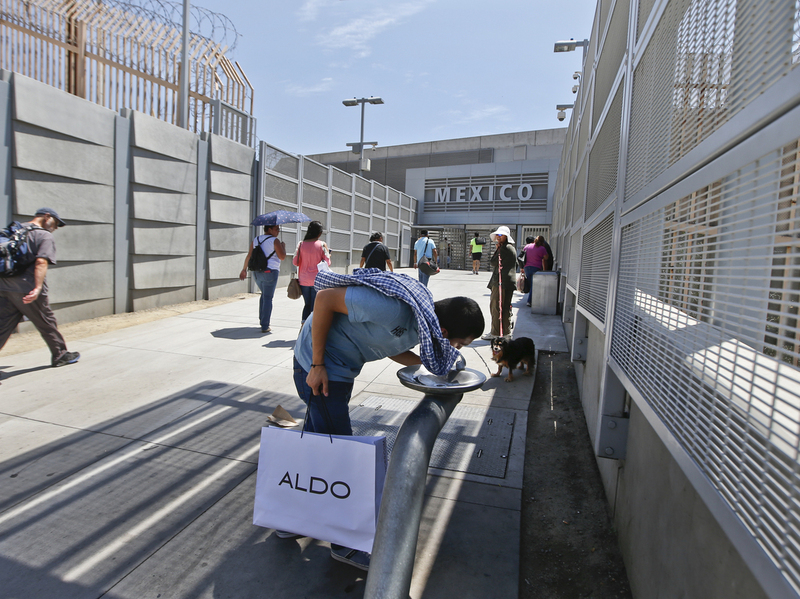 Mexican officials say the new measures — and a new, three-story facility for pedestrian traffic at the San Ysidro border crossing — were put in place to bring border crossings into compliance with Mexican law. "The way that people enter Mexico has been growing very disorganized, and now we are making it organized, that's the big difference," said Carlos de la Fuente, general director of construction and appraisals for Indaabin, the Mexican agency in charge of building federal facilities, according to The San Diego Union-Tribune. It adds that "for the first time, foreigners will be processed in separate lines from Mexican nationals." The new system also may help crack down on American criminals who flee to Mexico to avoid arrest or prosecution. The Associated Press reports that border inspectors "will tap into international criminal databases." It adds: "More than 120 Americans expelled from Mexico this year while living in Baja California [state] had arrest warrants in the U.S., according to Figueroa, delegate of the National Migration Institute. Some ordered to leave last year were on the FBI's most-wanted list." But with more than 25,000 pedestrians and 50,000 motorists crossing the border daily between San Diego and Tijuana, there are concerns that the new system will lead to long lines that could hurt the economy in Tijuana, which relies partly on American tourism dollars. Rodulfo Figueroa, Mexico's top immigration official in Baja California state, which includes Tijuana, said the new port will promote security, not damage the economy. "This is about putting our house in order," Figueroa said, according to the AP. "If the line becomes clogged up, we will just let everybody through. If we can't check everybody, we won't." As the Union-Tribune reports, officials say the $6.9 million structure will be a model for other crossings as Mexico overhauls its border security, but some finer points remain unresolved. For example, the newspaper says, Baja California Tourism Secretary Oscar Escobedo wants to persuade officials that foreigners shouldn't have to fill out an entry form. "It's illogical that if you drive across, you don't need to fill out the form, and if you walk across, you need to fill out the form," he said.